Investors will often look at the P/E ratio of the S&P 500 in order to gauge how expensive stocks are. Earnings, the denominator of that equation, are quite volatile, however. In a year like this one, where massive write-downs plague income statements, it is difficult to determine the market's true earning power. There are a couple of interesting observations to note in the above chart. First, on a price to book basis, during this recession the market did not fall to the depressed levels seen in the late 1970s. Second, the market's price to book value currently appears to be fairly close to its 30-year average (denoted by the horizontal blue line), despite the fact that the outlook for economic growth appears tepid. Of course, there are a number of factors that make historical comparisons of price to book values difficult. Accounting methods of how book value is calculated have changed over the years, with an increasing trend towards making book value better reflect market value. Furthermore, there has been a shift when it comes to industries in the S&P 500, with manufacturing companies playing a decreasing role while knowledge-based companies (e.g. software, consulting, other services etc. ), where hard-assets are not a determining factor, comprise a larger portion of the index. For the above reasons, long-term comparisons of historical price to book ratios can be problematic. Nevertheless, investors can look at the price to book ratio over recent periods as a decent gauge of investor sentiment. Clearly, price to book ratios fell dramatically from their 2008 highs, but a large rally has resulted in a recovery of a significant portion of those losses. 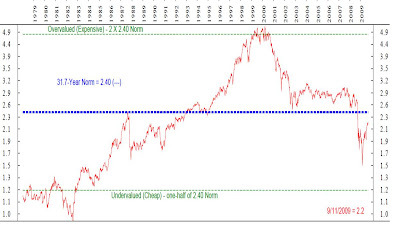 The above chart won't tell you where the price to book ratio will go, but it will tell you that investor sentiment has recovered to a large extent and that downside risks have increased as a result. I think when looking at price-to-book and comparing them with levels decades ago, you need to take into account that companies these days may run at higher returns on equity. Specifically, I'm thinking of software companies that don't have high manufacturing or distribution costs so they don't have those kinds of assets. Google is trading at about 5 times book value, but at a p/e of 37. Even if you believe Google is overpriced (I do), a valuation with a p/e of 15 will still give Google a p/b of over 2. And it is also important to look at the capital structure. Several companies had tons of extra cash and no debt. Just look at the tech sector. I wonder if someone has ran a (MV+Debt)/EV analysis.